Worcestershire fast bowler Charlie Morris says winning his battle to remodel his action has been a long, tough "mentally taxing" journey. 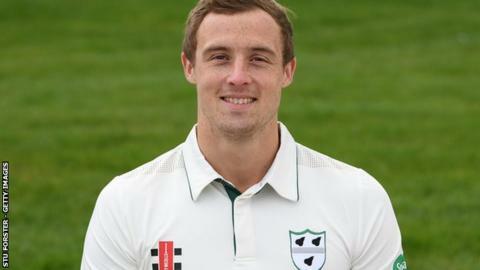 The 26-year-old Hereford-born ex-Devon paceman looked on his way to stardom when he got more than 50 wickets in helping the Pears win promotion in 2014, a figure he matched in 2015. But he then ran into issues with his right-arm fast-medium bowling action. "It's not been easy to get through," he told BBC Hereford & Worcester. "Mentally, it has been an incredibly taxing journey. And I've had to work with a sports psychologist, as I still have to deal with a lot of self-doubt, as a lot of people have to in life." Morris has worked primarily with two fast bowling coaches in his time at New Road; Matt Mason, now doing the same job with Leicestershire, and Alan Richardson, the current occupant of that role. And it was fitting that both of them were present at Grace Road, Leicester, on Sunday to see Morris take a career-best 7-45 and help the Pears to an innings win over the Foxes. "To be honest, I have so many people to thank it must sound like an Oscar-winning speech," he smiled. "And it's not just the coaches. I've always been extremely grateful for the support I've got and continue to get from all the guys in the changing room." After first encountering problems duding the 2016 season when he took just 11 wickets in seven matches, Morris then missed the entire 2017 season and played just four times in 2018. But, after doing so well, with eight wickets in the match on his first County Championship appearance since last June, he now has to wait until 14 May for another bowl in red-ball cricket. Worcestershire now go into One-Day Cup action, with eight group matches to get through before they host Durham in the Championship. "We just have to look to take the momentum into the game against Durham in four weeks' time," he added. "But this performance shows the hard work we've put in all winter. And we've still got Joe Leach and Dillon Pennington to come back in too. "It's been tough for me. It's taken a few years, But last season I felt I was starting to get somewhere. "Now I'm happy just to be back out there and playing. And to get a career-best, I can't quite believe it. I'm over the moon."